A mosaic mural dedicated to the Black Saturday fires of 2009 in the Central Victorian localities north of Kyneton commemorates the many homes and a church lost on that tragic day. 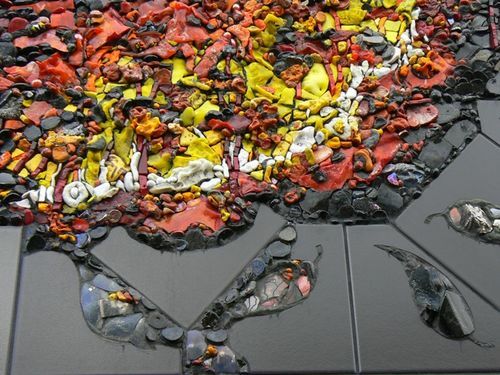 A richly mosaiced fire front landscape scene sets the theme with surrounding black tiles inlayed with fire burned materials. The neighbours, friends and wider community tiles transition from dark colours to lighter depending on their proximity to the event.